Generally, high net worth divorces are complex due to the different types of assets and contractual agreements involved. While you can start the divorce process by identifying and documenting all marital and non-marital assets and debts, you’ll need an experienced attorney to draft a divorce agreement that allows for an equitable distribution of assets. To speed up the process and reduce legal expenses, your attorney should also help you avoid litigation. Before you meet with your attorney, you can do some of the work yourself and identify all marital and non-marital assets. A non-marital asset is property that was gifted to or inherited by one of the spouses or possibly assets that they brought into the marriage. In some instances, even such an asset could become marital property. For example, if the couple decides to sell the home one of them owned before the marriage and jointly purchased a new home, the new home would most likely be considered a marital asset. However, if there is a prenuptial or postnuptial agreement, these documents may call for a different treatment of your assets. It will be necessary to get an accurate listing of all your assets and debts. This includes anything that is owned jointly or just by one of the spouses. For example, you may have a vehicle in your name only, but it can still be considered a marital asset. Your lawyer will use this information to start working on a plan for equitable distribution, but it may also become a negotiating tool as you work out a solution with your ex-spouse. The more assets you own, the more difficult and time-consuming it will be to classify and value them. An experienced high net worth divorce attorney will make this process as easy as possible. With large estates, it can be tricky to estimate future earnings, especially when foreign assets, private partnerships, or new investments are the basis of your combined wealth. With low and median income earners, it’s not too complicated to arrive at a reasonable amount for alimony and child support. After all, the partner who has to make the payments must still be able to pay their own bills. Additionally, the goal is to keep the standard of living for children about the same, if possible. In a high net worth divorce, income is usually not a limiting factor. However, it can be tricky to decide if and how much alimony and child support must be paid. If both spouses receive substantial assets in the divorce, the need for alimony or child support may not appear obvious to a judge. An experienced attorney can help you come up with a solution for your case. A high net worth divorce does imply that the divorcing couple is wealthy, but it’s rarely just a matter of having more money in your bank account. In a high net worth divorce, most assets aren’t liquid or even easily identified as valuable. Therefore, a divorce attorney must understand prenuptial and postnuptial agreements, be familiar with foreign properties and assets, order a financial valuation of all non-cash assets, and modify the divorce agreement accordingly. It’s imperative to find a Daytona Beach high net worth divorce attorney who can satisfy these requirements for your divorce. Not only will they understand the stakes and issues at hand, but they’ll also understand how to simplify the process. For instance, they already have the right contacts to order valuations of your business. Additionally, they can help you avoid litigation to keep the costs of the divorce down. If you want to spend more money and devote more time to your divorce, it’s best to pursue litigation. Truthfully, going to court with a high net worth divorce won’t make either spouse happy. Instead, it will provide a paycheck for your respective lawyers while it draws out the process until your divorce is final. To avoid litigation, you must be willing to compromise and keep it fair. Your attorney can be an important part of the negotiations. They may also recommend mediation or arbitration as a last resort. 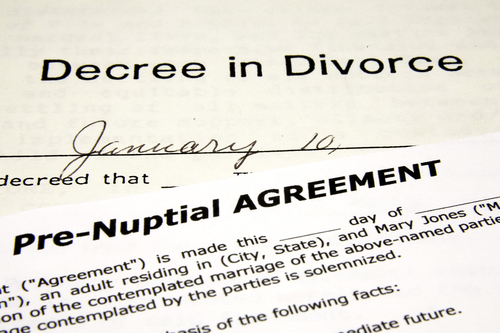 At The Harr Law Firm, we have years of experience with Daytona Beach high net worth divorces. Whether you have questions about your prenuptial agreement or need to understand the value of your joint assets, we’re happy to help. Give us a call or get in touch using our online contact firm!